END of TRAIL - Volunteer as a Waddie! Sign up to join our Waddie Team at END of TRAIL is now OPEN! 2019 boasts lots of great fun- and awesome rewards and benefits for our EOT Waddies! Waddies are a crucial workforce for END of TRAIL. The success of the event as a whole hinges upon the dedication of the folks who sign up to volunteer their time as Waddies. These renowned folks play an immeasurable role in the success of END of TRAIL! The term "Waddie" originates in the true American Old West. A Waddie is defined as: One of the words for cowboy, especially a cowboy who drifted from ranch to ranch and helped out in busy times. Just like the waddies of the Old West, END of TRAIL waddies are Cowboys who come to Founders Ranch to help out in our busiest time- END of TRAIL! In exchange for your volunteering as an END of TRAIL waddie, you'll receive your meals when working, camping, parking, and many other goodies exclusive to waddies! You'll earn a gold dollar a day as an homage to the true Old West waddies, and- earn points toward SASS membership, merchandise, Founders Ranch Range fees, and even EOT Entries! The END of TRAIL schedule is jam-packed with opportunities for you to help. And we need you! Whether you have just a few hours here and there, want to volunteer for a special event or task, or if you'd like to attend END of TRAIL as a Full time Waddie, we'd sure love to have you! In addition to "a dollar a day and "found" (food)" as was traditional in the Old West, all hours spent volunteering as a Waddie qualify for the Founders Ranch Waddie Volunteer reward program. Waddies will recieve $5 Volunteer bucks for every hour volunteered- to be spent on any SASS or Founders Ranch sponsored event, merchandise, range fees, or membership. A special pre-event Welcome and Thank you dinner at the Ranch house hosted by the Wild Bunch will be held early in the event- as well as a post-event dinner at a local restaurant as a small sign of our thanks. 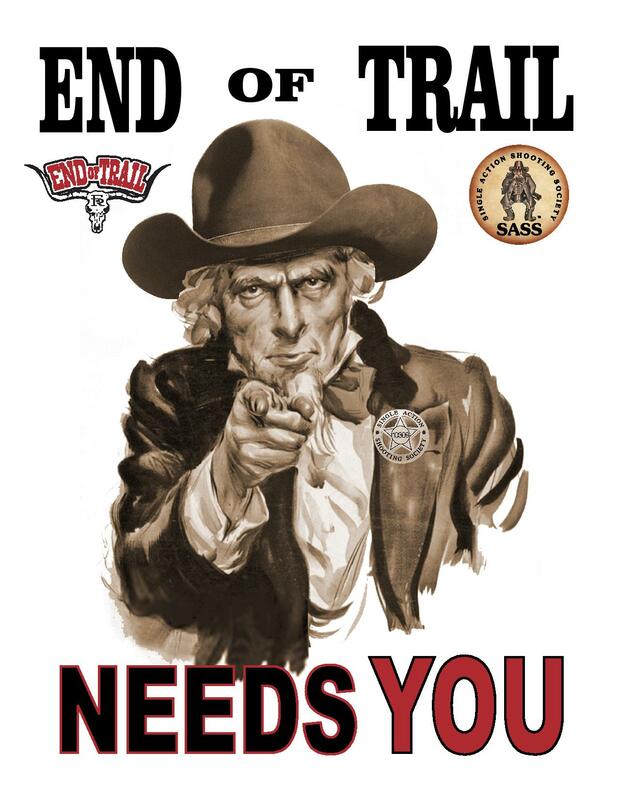 Thank you for considering being a part of END of TRAIL! Waddies are so dang important...bless those that give of their time... They deserve the biggest buckles! Interests:Kids and grandkids, old guns and cowboy shooting, bison hunting, woodworking and guncart building. Interests:Cowboy and Sporting Clays, buying interesting guns. You'd be more than welcome. EOT is like a big family party and we're always looking for new pards. If you're above ground and moving you'll have a great time! OO, I’d bet you’d be very welcome and whatever you can do would be greatly appreciated. I'll be there to do whatever needs to be done !! I'm signed up....working at least a few hours per day from 17th through 22nd. First time, so I'm excited, expecting to see and learn a lot. Come on folks, being a Waddie at EOT is a whole bunch of fun. Sure there’s work BUT where else will you get to rub shoulders with and visit with the greats of our game? There’s plenty of jobs that need to be done and one of the best things about being a Waddie at EOT is when you’re leaving on the last day with a big smile on your face knowing that you were a big part of making the whole event happen. Since Misty has taken the reins at SASS Waddies are really treated like part of the family and are welcome at all of the events that everyone else is invited to. On Monday before EOT really kicks off they have a very nice Waddie dinner up at the Big House and they really make you feel welcome. Tex, Judge Roy Bean, Cat Ballou, Justice Lilly Kate, Misty and all of her crew will be there and it is a special evening. Even if you’re shooting the match there are time slots that you can work in if you want to help out. I just signed my grandson Nick The Kid up to help out wherever they need him. If you Waddie or not please stop by the front gate and say Howdy and if we haven’t met I can’t wait to meet you. Thank you!! Cant wait to welcome you to END of TRAIL!